And we all thought HP has killed off it’s Windows 7 tablet plans. 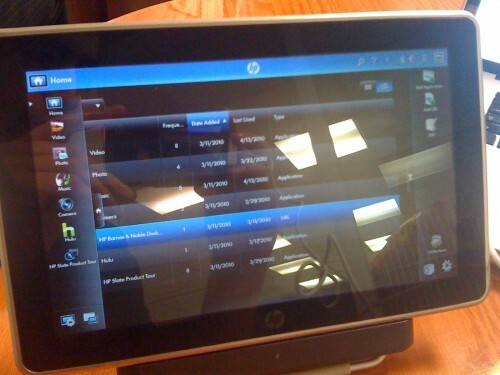 HP has formally launched the HP Slate 500 running on Windows 7 Home Premium and just like RIM’s Playbook, it’s aimed at enterprise users. Rumors abound that HP’s first entry into the tablet market would run on WebOS but here we are looking at a tablet with Window 7 on it. As this is for enterprise use, it’s probably best to expect a WebOS version for regular consumers like us in the works. RAM : 2GB DDR2 RAM. Operating System : Microsoft Windows 7 Home Premium. Camera : 3MP Camera on backside and a VGA camera in front. Ports : SIM card slot, USB 2.0 port, SD card slot, a dock connector and microphone jocks. Screen : 8.9 inch Diagonal, 1024 x 600 pixel, multi-touch display. Graphics : Intel Graphics Media Accelerator 500 with shared graphics memory, Broadcom Crystal HD Video enhanced accelerator. Battery life : HP Slate contains 2-cell battery and 5 Hour battery life. Adapter : 25W/30W A.C Adapter for U.S and other Countries respectively. 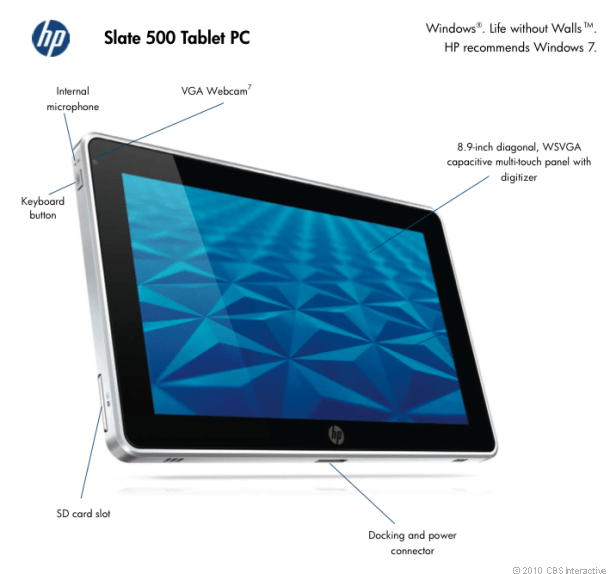 The HP Slate 500 supports multiple input devices aside from the touchscreen like an optional keyboard and optical mouse, as well as the HP Slate Digital Pen. To complement this, the tablet also comes with Evernote, Adobe Reader, and Adobe Acrobat built in (eeew lol), along with some HP-branded software. The HP Slate 500 will be sold as a kit, including the HP Slate Digital Pen, HP Slate Dock, and HP Slate Portfolio for just $799. Availability is currently limited to the US market and HP has yet to announce plans for worldwide distribution.